The arrivals of natural gas, lower prices and a mild winter were all too little, too late, observers say. When Madison Paper Industries connected to central Maine’s first natural gas pipeline in April 2014, it was lauded as an achievement for both the mill and the pipeline company, estimated to bring both big cost savings and a reduced environmental impact to the area. The Summit Natural Gas pipeline project did that, with the mill saving an estimated $5 million each year while its boilers ran on natural gas to heat the mill facilities and dry paper. But the energy savings weren’t enough to save the mill from insolvency. The natural gas that flows through the Summit pipeline makes up just a small part of the energy used by the Madison mill, which will close in May, eliminating the jobs of more than 200 workers. With low electricity and gas prices this year, it’s “almost kind of tragic” to see manufacturers such as Madison Paper closing their doors when more natural gas is expected to flow to the area soon, said Patrick Woodcock, director of the Governor’s Energy Office. It takes about 350 million kilowatt-hours – more than 32,000 times the amount used by an average household per year – of electricity to make the roughly 195,000 tons of paper the Madison mill produced annually. About 40 percent of the electricity needed to run the mill comes from the mill’s on-site hydropower facility, and a small amount is purchased from Madison Electric Works. But most of the electricity that runs the mill is purchased from ISO New England, a regional electrical corporation that produces electricity via generators throughout New England. The electricity is purchased by customers such as Madison Paper at an hourly rate depending on demand. But the mill and others in New England have struggled to procure reliable electricity at affordable prices to the point that it has been a factor in temporary layoffs and shutdowns. If there is low demand for electricity, prices are low. But when demand is high – such as on a cold winter day, when there is more demand for heat – there isn’t enough natural gas in New England to keep prices low. Last month, ISO New England said in a statement that electricity prices in New England were at nearly a 12-year low in 2015 because of low natural gas prices for most of the year. About 49 percent of the company’s electricity is produced from natural gas. In June 2015, electricity prices at ISO were at their second-lowest since March 2003, at $19.61 per megawatt-hour, the statement said. Yet despite the overall low cost in 2015, February of that year featured some of the most expensive electricity costs at ISO, with an average cost of $126.70 per megawatt-hour. That was also around the time the Madison mill announced it would be issuing temporary layoffs for employees and ceasing production for a two-week period. Efforts are underway to expand pipeline capacity in New England, including two projects by Spectra Energy – the Algonquin Incremental Market project and the Atlantic Bridge Project – which are expected to bring more natural gas into New England and Canada. Spectra owns the bulk – 78 percent – of the Maritimes pipeline. Construction began last year on the first major natural gas pipeline expansion designed to ease a bottleneck that’s keeping more gas from the Marcellus Shale deposits in Pennsylvania and New York from coming into New England. The $1 billion Algonquin Incremental Market project, or AIM, is slated to go into service this November, pumping enough extra gas to heat 350,000 homes a day in southern New England. Madison Paper connected to the Summit natural gas line in April 2014 following six months of delay. The mill has been the anchor customer of the 68-mile steel backbone transmission pipeline in the Kennebec Valley that starts in Richmond and cuts north into Somerset County. 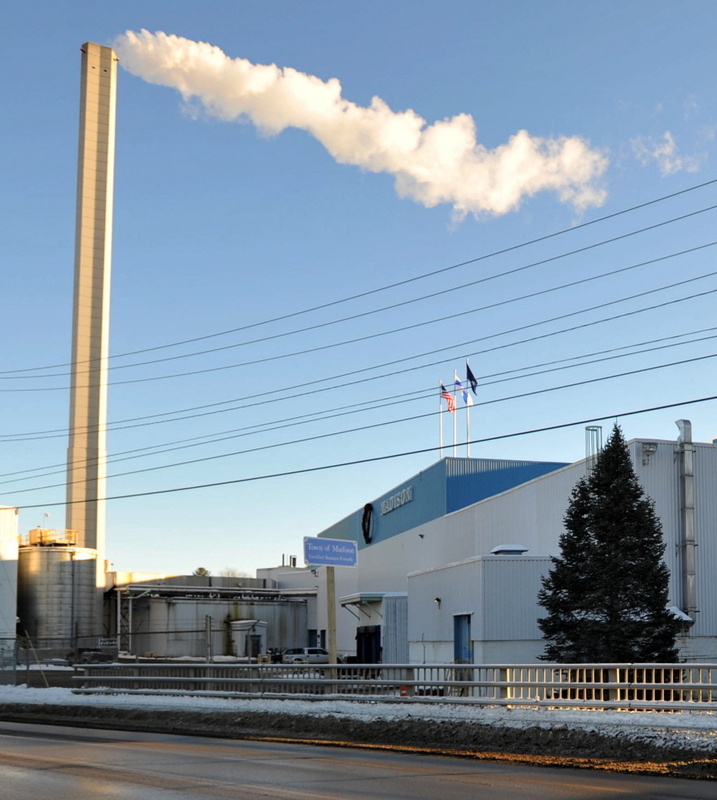 Lizzy Reinholt, a spokeswoman for Summit Natural Gas, said the loss of Madison Paper, one of the company’s major customers in central Maine, will affect Summit, though she would not say what the financial loss will be for the company. She said the company has plans to break ground on new construction areas in May. In 2014 Sappi Fine Paper in Skowhegan, like Madison, also connected to the Summit natural gas pipeline, with officials at the time estimating a 30 percent reduction in energy costs from the connection, which is primarily used to operate the mill’s lime kiln. Burning natural gas provides a heat source for pulp chemical conversion and also can be used in one of the boilers to generate steam, according to Sappi spokeswoman Olga Karagiannis. The mill is capable of generating 100 percent of its electrical needs on site with steam turbine generators, but also purchases electricity from ISO New England in various amounts. Depending on the time of year and production plans, Sappi also relies on biomass for its energy needs. Yet like Drechsel, Karagiannis said it is important for Maine to complete the Energy Cost Reduction Act work. When Madison Paper announced this month that the company will be closing its doors in May, the mill cited as a top reason the decline in demand for supercalendered paper, the glossy magazine paper it makes. But a few harsh winters such as the ones the region endured in 2014 and 2015 also factored into the mill’s demise, according to Drechsel, who compared high energy costs to pneumonia. “They weakened us. So in 2016, when energy costs weren’t that bad because it was a mild winter, but we had (less) product demand and the low value of the Canadian dollar, we just couldn’t recover from that,” he said. The company and others around Maine have called for an increase in pipeline capacity in New England to address the issue. In 2013, Maine was one of the first states in New England to pass legislation aimed at expanding pipeline capacity with the Maine Energy Cost Reduction Act, which allowed the Public Utilities Commission to buy pipeline or order its electric companies to do so.